Farming is hard work, but being a farmer in places such as Kenya, Botswana and Sri Lanka has a unique challenge that other areas of the world don’t have: elephants! Wild elephants, whose natural behaviour is to roam, have been known to march through crop fields and causing damage to, or even destroying, crops. When the farmers try to intervene, things can turn ugly, with both human and elephant injuries and even deaths. Sadly, like too many animals, elephants face many dangers at the hands of humans. Elephants are intelligent, sensitive, and have complex emotional and social connections with one another and with different animals. A solution was needed that would both keep the farmers’ fields safe and make sure the elephants were not harmed. This solution was not only brilliantly simple, but also had the added bonus of helping out another species in crisis: bees. In areas where elephants are free-roaming, humans and elephants have to coexist. However, the farmers became angry when the elephants raided their farms and tried to scare them off with guns, rocks and fireworks. Both were serious issues as the farmers relied on their crops for income but the elephants were being injured and killed. There seemed to be no simple solution until zoologist Dr. Lucy King noticed that elephants don’t like bees and will avoid them at all costs. This is because the bees’ stings are especially painful to the elephants’ trunks. If elephants hear buzzing, they will assume that it is bees and leave the area immediately as well as signal to other elephants that bees are in the vicinity. Thus bee fences were born! “Bee fencing” is the use of hanging rows of beehives each connected by a length of wire. When an elephant approaches, it will knock into the wire, setting the hives swinging and disturbing the bees. The elephants hear the buzzing and leave. The crops are safe, the humans are safe, and the elephants are safe. The bees are safe too. 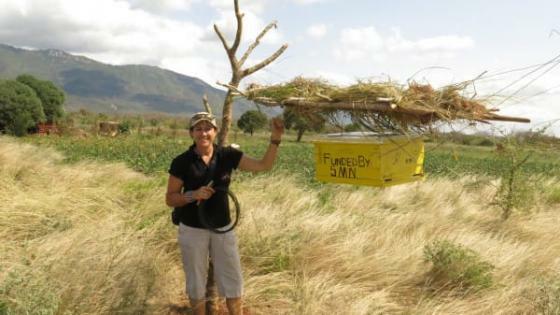 Dr. King has been working with various conservation organisations to build bee fences around local farms in Africa and Sri Lanka. She hopes that bee fences will be the first of many other initiatives to create sustainable solutions for humans and animals to coexist peacefully. 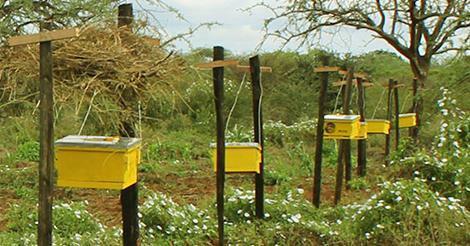 The project has also attracted the attention of important organisations who are contributing to create more bee fences. The bees also help pollinate fields and maintain the biodiversity needed to support an ecosystem, which is an additional benefit for farmers. Farmers also get to keep the honey and beeswax produced by their hives, which they can use or sell. This “elephant-friendly honey” is available in local shops near the areas where the farmers live and work, so unless you’re planning a visit to Nairobi, you won’t be able to get any!